Google isn't kidding when it says it's serious about the enterprise. The company announced a pair of new services on Monday that are aimed squarely at helping businesses access information and share it internally, similar to what Microsoft's SharePoint product offers. A new Springboard app gives employees at companies subscribed to Google Apps for Work a unified search box for finding just about anything, including files in Google Drive, emails in Gmail and contacts. The company also unveiled the beta version of a revamped Google Sites, which is aimed at letting less sophisticated users inside a business build websites that can be used to share information internally. The new Sites gives users templates and an easy to use editor. The editor is supposed to help create good-looking sites for communicating things like what a particular team is up to at a company with far-flung offices. These two products seem like competitors to enterprise collaboration software like Microsoft SharePoint, which serves as both a repository for data and as the hosting platform for websites that can be used to communicate internally at a company. In addition to searching for information, Springboard will also display files and contacts for users based on machine learning algorithms that are informed by what calendar events users have on their schedule and a variety of other signals. Users can now see that on the Web and in an Android app. In the future, Google will also have an iOS app available for Springboard. Springboard is an extension of Google's other enterprise search efforts, including search features inside the individual products that Springboard pulls from. What makes the new service so interesting is that it's a one-stop shop for users to try and find what they're looking for. Ryan Tabone, a director of product management at Google, said in an interview that at this point, Springboard only connects to Google services, but that the company is evaluating what services it will connect to in the future, including potentially connecting to data stored on premises. Users work together on a Google Site using the new editor announced on January 13, 2016. 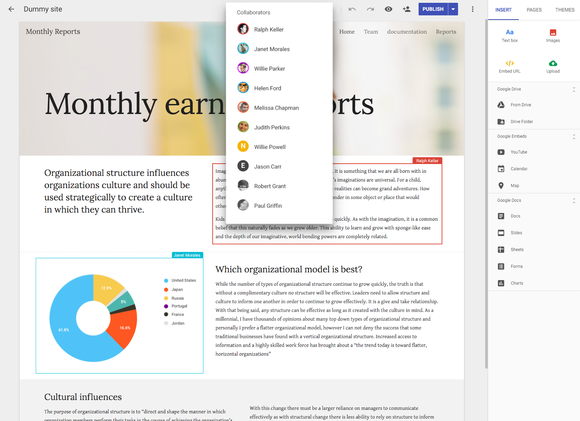 Like Google Docs, users can invite other people to work together on a Site at the same time. The software will show a marker where each person is working, along with live-updating changes as they tweak a page. 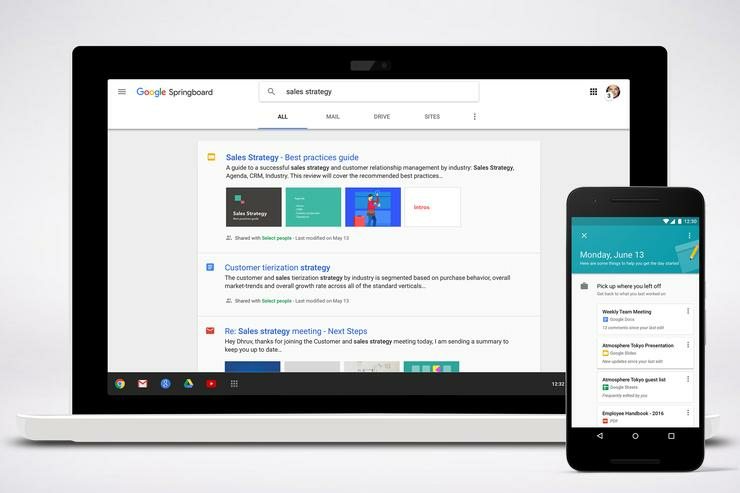 Google has been trying to get Office customers to switch to its Apps for Work suite, so it makes sense that the company would invest in trying to build something that competes at least in part with SharePoint. It's still early days for both products, which are just entering beta, so it seems unlikely that either is in a position to kill the far more mature SharePoint. Google Apps for Work administrators can sign up for a private beta for each of the two different services starting Monday. Tabone said that Google is going to start slow when inviting organizations to test out the services. As the company gathers feedback from existing testers, it will expand the program further and further, making changes as it goes.